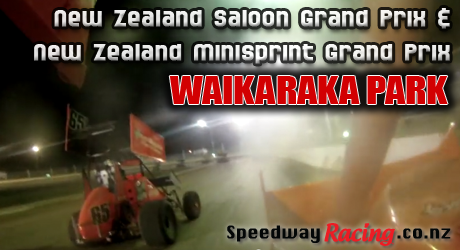 Get along to Waikaraka Family Speedway this weekend for the New Zealand Saloon Car Grand Prix and New Zealand Minisprint Grand Prix. Camaros, Corvettes, Mustangs, Commodore and Falcon V8’s racing door handle to door handle and bumper to bumper for the NZ Saloon Car Grand Prix at Waikaraka Family Speedway. Also on the programme will be the NZ Minisprint Grand Prix which will see the best Minisprint drivers tearing it up on the track. There’s also a Stockcar Teams Race on Friday night (Auckland vs Waikato) and also StreetStocks and Stockcar racing, along with the MinisSprint practice. Then Saturday will bring SuperStocks and the Modifieds.